AUGUSTA — Democrats in the Legislature are backing new initiatives in health care, education and other fields that will require significant amounts of money, raising the prospect of higher taxes for at least some Mainers. House Speaker Sara Gideon, for example, has introduced a bill that would fund paid medical leave with a 0.5 percent tax on Maine workers’ earnings. Other Democratic initiatives, still in the draft stage, will propose universal pre-kindergarten in public school systems, more spending on addressing the opioid crisis and moving ahead with Medicaid expansion. At the same time, Democratic Gov. 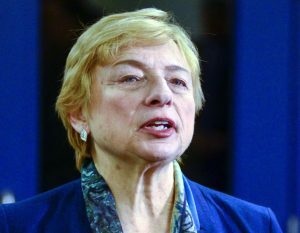 Janet Mills has said she will implement Medicaid expansion and submit a two-year budget to the Legislature next month that will not increase taxes. It all adds up to indicate that taxation will be a key issue as the Legislature rolls into action with Democrats in the driver’s seat after eight years of tax cuts and lean government under Republican Gov. Paul LePage. Ranking Democrats on the Legislature’s Taxation Committee said that they would look to create what they see as fairer tax system in Maine, which could mean increasing taxes on the wealthy in order to funnel more money into property tax relief programs, public education and health care. “I think we’ve seen a huge tax shift over the last eight years,” said Rep. Ryan Tipping, D-Orono, the House chair of the Taxation Committee. Tipping said LePage’s move to cut the top income tax rate from 8.5 percent to 7.15 percent largely pushed the costs of funding public services onto the shoulders of property taxpayers. “The benefit of that has gone to the top income brackets in the form of income tax cuts,” Tipping said. He also believes there still are tax loopholes to close, especially for companies that shelter revenue offshore, or online retailers, some of whom are still dodging the collection of state sales taxes. In all, state government could be faced with as much as $700 million in new expenses over the next two-year budget cycle. Many of those costs are now built into state law, like the Medicaid expansion, which is expected to add as many as 70,000 low-income Mainers to the state and federally funded health care program at a cost to the state of at least $50 million a year. Advocates for the expansion emphasize that expense will also draw down as much as $500 million a year in federal matching funds under the Affordable Care Act. Tipping and other Democrats have said they will draw on a state budget surplus of a nearly $273 million to help pay for some of their proposals. Additional revenue would still be needed to fund everything on the Democrats’ wish list for 2019. Lawmakers also must find a way to continue to fuel increases in public school funding that was bolstered in the current budget with a one-time infusion of $162 million in 2017. That increase was part of a compromise that reopened state government after a short shutdown and led to the repeal of a voter-approved law that raised income taxes by 3 percent for top wage-earners. Additional public school funding of between $40 million to $50 million a year also would be needed to advance a proposal that would create a universal pre-kindergarten program in Maine, favored by Mills and other Democrats. Sen. Ben Chipman, D-Portland, the Senate chairman of the Taxation Committee, said it’s the Legislature’s responsibility to fund programs that are already in state law, such as Medicaid expansion. Chipman said the state currently has a budget surplus largely because of the strong economy and as economic growth continues, it provides the state with additional resources. “We certainly have a lot of need for that new revenue,” Chipman said. He and Tipping expect to see a variety of bills on tax policy, although no one has yet proposed a broadening of the sales tax in order to reduce pressure on the income tax, Chipman said. Tipping said Republican critics will claim Democrats are poised to increase taxes again, but he says that’s not the case. “Everything we are talking about here is not tax increases,” Tipping said. He said some measures, such as increasing state funding of schools, would provide property tax relief for the middle class, working families and the elderly. Republican leaders have so far had a muted response to concerns that Democrats will undo the LePage-era tax cuts – which they say have helped fuel a stronger state economy. Senate Minority Leader Dana Dow, R-Waldoboro, has said his caucus is “ready to go to work, we are ready to roll up our sleeves, we are ready to compromise and we expect that we will be listened to. We hope that we will be listened to.” But Dow said Republicans also would work to protect the interests of businesses in Maine. John Bott, a spokesman for House Republicans, said Wednesday that conservatives will push back against anything they see as a tax increase.